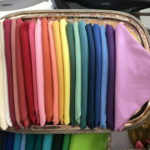 Citrus Green 20×20 Napkins, Polyester Blend Total Stock: 196 Pictured: Top Row, 2nd in from the left. Citrus Yellow 20×20 Napkins, Polyester Blend Total Stock: 370 Pictured: Bottom Row, 8th in from the left. Dark Brown 20×20 Napkins, Polyester Blend Total Stock: 357 Pictured: Bottom Row, 5th in from the left. Dark Navy Blue 20×20 Napkins, Polyester Blend Total Stock: 120 Pictured: Top Row, 6th in from the left. Dark Red 20×20 Napkins, Polyester Blend Total Stock: 184 Pictured: Bottom Row, 4th in from right. Dusty Rose 22×22 Napkins, Cotton Unlimited Stock Pictured: 6th in from the left. Forest Green 22×22 Napkins, Cotton Unlimited Stock Pictured: 8th in from the right. Gold 22×22 Napkins, Cotton Unlimited Stock Pictured: 10th in from the right. Hot Pink 20×20 Napkins, Polyester Blend Total Stock: 160 Pictured: Bottom Row, 2nd in from the right.